I have long been an advocate of shopping locally, while thinking globally, and I think the same can be applied to wine. I have always thought that I would rather spend $30 on a bottle that was produced by a small time operator that was locally owned, then $15 on a corporate wine that will get lost in the economies of scale. Particularly in this time of economic distress, I think it’s more important than ever to support the little guy. I am in a unique position to be able to afford the luxury of wine, and I do what i can to support the small retailers and producers. This past weekend, my social media and wine friend Shana (@sharayray) and I took off for parts well known, but wineries not as well known, for Weekend 1 of Russian River Barrel Tasting. Along the way, while I admit we ducked in to old favorites, we also discovered new favorites among the list of some 100+ wineries pouring their wares for this annual event. Here are some of our favorites from the first weekend, with more to come next weekend! Truett Hurst (@truetthurst) yes ok old fave but have to plug it!) Who is making amazing Petite Sirah as well as Pinot and several zins on their bio-dynamic property on Dry Creek Road. Mounts Family Winery (@mountsfamwinery) – While I have been going to Mounts for several years, their hidden location off of West Dry Creek Rd. makes them a gem that is just starting to be discovered. The family atmosphere and the delicious Rhone focused wine is worth a visit even on your most hurried trip. I really love their Syrah and Zin, and we got to taste their 2nd ever Malbec, which will be released in another year or two. Michel-Schlumberger (@m_schlumberger), an historic winery but well off the beaten path, next to Mounts. Boy what a visit we had! After meandering through the cellar to taste some barrels, we tasted current releases which were being offered for a great deal. Furthermore, they were having their annual Stash Sale, and Shana and I scored a case of 2001 Pinot for a song. YES, I know we were in Dry Creek, but the 2005 & 2001 pinots were exquisite! The property is up against the ridgeline, and the cool fog and Russian River influence provide a morsel of pinot passion here. Oh did I mention their Cabs were phenomenal too? Judd, the President and Chief Blogger Ambassador, kept us entertained with the libations and we were hard pressed to leave. We’ll be back next weekend! Copain Wine Cellars (@copain) – This was my first visit to Copain, but I have been hearing about it from my friends in the wine community for several months. With expansive views of the Russian River valley from it’s perch above Eastside Road, the wine and the views will keep me coming back for more. Their Rhone varietals were representative of the region and I fell in love with their GSM. I will certainly be back for more. Hawkes Wine -(@hawkeswine) Located next to the Jimtown store in Alexander Valley, this small tasting room ha some yummy cab to go with the chocolate pudding we had for lunch. YUM! Stuhlmuller Vineyards – another new discovery, this family property is up a long isolated road, off of Healdsburg Avenue north of town, where Alexander Valley meets the suburbs. We were really in the country here and they had Coq au Vin that hit the spot. I didn’t get to taste that much here since it was the end of the day, but it’s a great location and I will certainly be back. 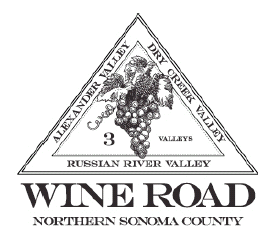 Route 128 Winery – is in an storefront in Geyserville. The teensy winery offers several different wines as well as speciality meats & olives to go with your tastes. Stop in and stay a while, you never know what you might taste! These are just a few of the new discoveries we made this weekend which are, in my opinion, worth going to. You of course should explore and make your own decisions, but with the number of small wineries and the multiplication of coop tasting rooms enabling small wineries to show their wares easily, you have no excuse for not being creative! Further adventures in urban winery exploration will include a visit t the new coop tasting room off of Ghiradelli Square in San Francisco, Winery Collective. Winery Collective will feature several urban wineries, as well as some that are far afield, in order to offer a tasting experience closer to home. Bacon, Cheese, and Wine! OH MY! Now to try the up and coming Humantias soon! Thanks for such a great day. I look forward to trying other new up and comers with you! Likewise! SO much fun! Glad I got up to come see you again lol. I'm saving the Humanitas for when we can drink and blog it together so you just let me know when you want to twist my arm. Route 128! THat yummy Viognier is ALL GONE!!! I need to go back! 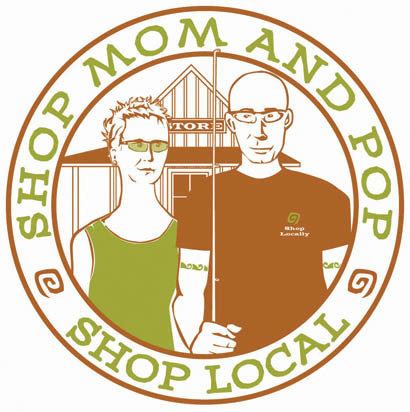 I love that shop local mom & pop logo – where does that come from ?